GOLD $1,300: Don’t Let the Bull Market Pass You By! I won’t lie to you; the head-fake in the S&P 500, Dow, and Nasdaq in the first three weeks of January was pretty impressive. The market makers did what they do best: pulling in new retail investors at the worst possible time, just to pull out the rug from under them. Trust me; you won’t get rich by buying the blue-chip stock market indexes after a head-fake. The bear market of December told the real story of what’s going on in the economy and markets: a global slowdown in growth, coupled with ongoing political tensions that won’t be resolved anytime soon. It was a stunning finish to a banner year for gold. And it was well deserved, as patient gold investors have been awaiting a breakout moment for a long time; the benchmark high of nearly $1,900 per ounce that was achieved in 2011 is now within sight. A more immediate target will be $1,300 and then $1,400, which is likely to happen within months or even weeks at the current pace. Institutional investors and retail traders alike are seeing barriers being broken and ceilings being shattered in gold’s price action, and they want a piece of the action before the train leaves the station. Technical analysts are watching the charts closely – trust me on that. They remember the hyperinflationary 1970s, when there was a mass exodus from both stocks and bonds, leading to a mind-blowing gold bull market in which the price rose from $35 an ounce to a momentary $850 price tag. 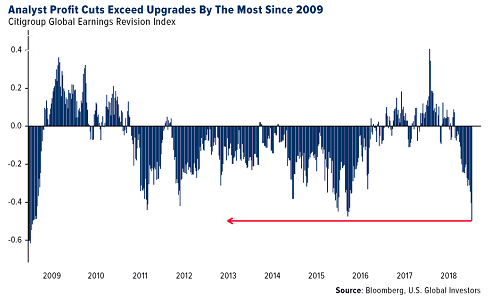 They also understand that it’s not a healthy market when the U.S. dollar outperforms 93% of asset classes, which is exactly what happened in 2018. In that regard, it was the worst year since 1901: in 117 consecutive years, we hadn’t witnessed a calendar year ending with 93% of assets down for the year. It was a stark reminder that the global economy is slowing down – and that the stock market indexes are finally starting to reflect this. It’s just bad news all around for the blue-chips: analysts are downgrading these big companies left and right in expectation of market carnage and even a global recession. What this means for you, as a smart investor, is that you need portfolio protection now – and that’s where gold serves its purpose like no other asset class. The way I’m allocating in this market environment is a mix of physical gold and carefully vetted gold mining stocks, which will magnify my returns when gold reaches new highs. To get some serious leverage in the coming gold bull market, I’m accumulating shares of Sandspring Resources Ltd. (TSXV: SSP, OTC: SSPXF). 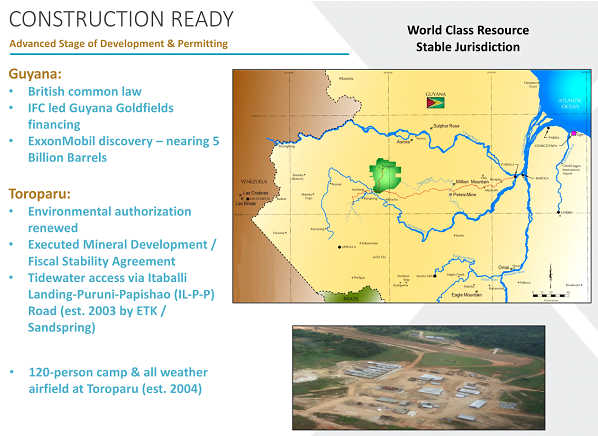 Sandspring’s flagship project in Guyana, South America, is known as Toroparu, and it’s a fully-owned 10-million-ounce gold asset located in the Guiana Shield region. Guyana is known as a perfect place to do business as a gold exploration company: mineral-rich, mining-friendly, and with a forward-looking government that makes it easy to conduct business there. The already highly promising Toroparu project was de-risked even further when it received a large infusion of capital from Wheaton Precious Metals (formerly Silver Wheaton), which committed a total of $153.5 million to the Toroparu Project. This commitment resulted in a reduction of the project’s finance requirements by approximately 30%. It’s time to get your portfolio ready for what’s coming very soon: gold’s great year, and serious price appreciation as shares of SSP/SSPXF catch up to the real intrinsic value of Sandspring Resources – the emerging leader in the international gold mining space. Editor’s Note: I’ll be making this a core position for myself and family.